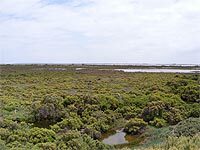 Saltmarshes are amongst the most productive ecosystems on Earth. 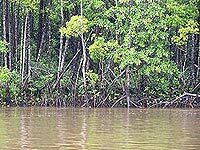 The production of biomass in wetland systems can be over three times higher than in a terrestrial ecosystem rivalling tropical rainforests. They contain a large amount of organic matter and are full of decomposers, which feed a wide food chain of organisms from bacteria to mammals. Many of the halophytic plants are not grazed at all by higher animals but die off and decompose to become food for micro-organisms, which in turn become food for fish and birds. Decaying dead saltmarsh plants break into small pieces (detritus) that provide energy for the marsh and its animals. In spring and summer, marshes are lush green, highly productive and grow in height. 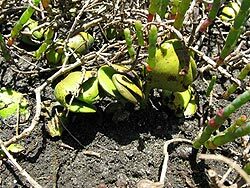 In Autumn, the green glasswort plants begin to turn brown as plants die and decomposition begins. Covered by tides most of the time,exposed twice a day for short periods. Covered by tides twice a day, exposed for shorter times. Lower levels covered by tides for short periods twice per day, upoper leevls only covered once or twice per year. Never covered by tides. Water, waves, wind and storms dislodge and break up decaying leaves, and transport them to mud flats and other locations around the marsh. This forms an attachment site for microscopic organisms such as bacteria, fungi and small algae. These organisms colonize the broken bits of plant material and break down portions of the detritus that are not digestible by animals. Most decomposition occurs on or in the sediments where bottom-dwelling scavengers such as worms, fishes, shrimps and crabs live. These animals eat the decaying plant material, along with the bacteria, fungi and attached organisms. They then digest the material and excrete the undigested plant remains in faeces that can be colonized again by microorganisms. As the microorganisms utilize detritus and reduce it to smaller and smaller pieces, the remaining detritus becomes fertilizer for the next plant crop. In this way, the whole food web cycle is repeated. Microscopic animals associated with detritus also cover the surface of mud in the salt marsh. They help stabilize sediments, provide food for larger organisms and contribute to an enrichment of the sediments. Large numbers of larger invertebrates live in salt marshes. 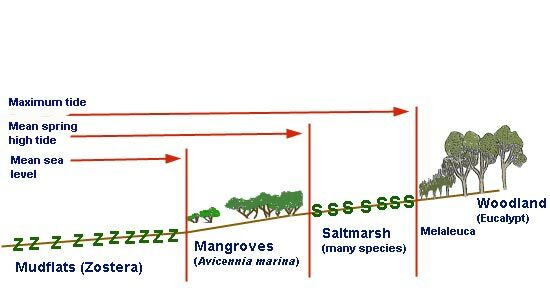 The rapid changes in salinity, temperature and exposure create stressful conditions and thereby limit how many species occur in this habitat. Succession is the gradual process of change in an ecosystem brought about by the progressive replacement of one community by another in a definite order until a stable community, that is a climax community is established over a period of time. 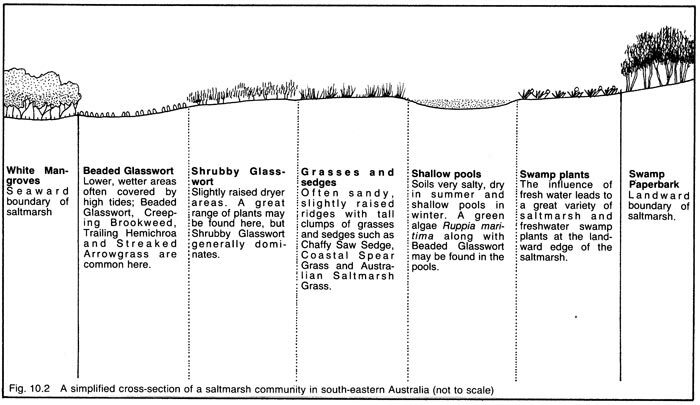 In some ecosystems like saltmarshes the different stages may all be present at one time. The succession starts with unicellular algae such as diatoms sticking the sand together by production of mucus forming a thin, slimy film of bacteria sticking to the surface. After this stage, filamentous algae appear. These algae are mostly blue-green algae like Cyanophyta and Chlorophyta. Small gastropods can feed and develop in huge quantities on it. Brown algae are loosely associated with this stage. The next stage is the germination of species such as Sarcicornia. The seeds germinate after some desalination of the soil by rain. As more sediment is trapped the substrate becomes higher and more stable. Mangrove seedlings establishing in salt marsh.